E.28 What is octagon? How to explain octagon ? How many types of octagon? The industrial normal questions:What is octagon? How to explain octagon ? How many types of octagon? 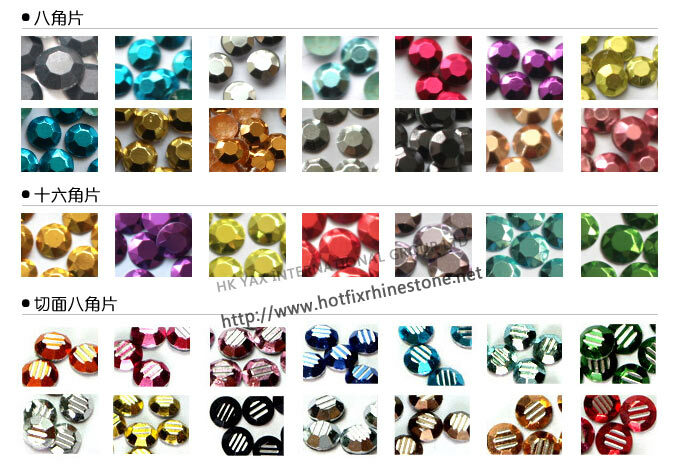 Ⅰ.Octagon, it is also called hot fix rhinestud and hot fix aluminum rhinestone. As we know,hot fix rhinestone has 8 cuts at least .The hot fix octagon is made according to rhinestone shape,except to use aluminum material and it is pressed forming by mould. There is a layer of paint between glue and aluminum flake,so that the glue can be better to stick on the aluminum flake.Many customers think that it is the bad glue caused glue fall off easily,however,it is the reason of reducing a paint process. First,plating colors on the aluminum flake,then,paint it and glue it on the back,finally to be hot fix octagon by press forming. The types of hot fix octagon: normal octagon with 8 facets,octagon with 16 facets,cut facets octagon,pattern octagon,fluorescent octagon. Ⅲ.The specific size mould match corresponding size octagon(rhinestud). The normal sizes: 1.5mm、2mm、2.5mm、3mm、4mm、5mm、6mm、7mm、8mm. Hot fix octagon also have 16 cut facets.